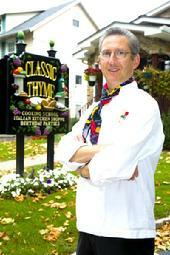 Chef David Martone is the owner and executive Chef of Classic Thyme Cooking School. At a very young age David had a keen interest in food. Learning to cook came easy as David was influenced by his entire family. David's Dad always told him that his Mother taught him to do all the basics at a young age, cooking, sewing, and cleaning, so that he could face the world knowing he could take care of himself. David's interest grew as his palate developed and food soon became a passion that is now a driving force in his life. Waking up at 2 AM in the morning, with a NYC Little Italy or Chinatown craving, was normal, and David would think nothing of calling and waking up his good friend Joe at that hour to make the trip for a meal.